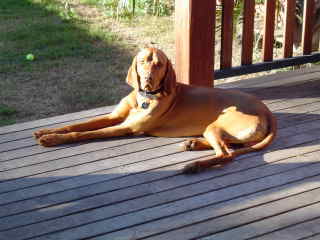 I have a Hungarian Vizsla named Roger. King Roger is very affectionate and is easily disciplined — he hates it if you yell at him. He will try to sit in your lap given half a chance. A breed trait is that when excited — such as when you come home — he picks up things in his mouth while simultaneously growling. Apparently Vizslas were originally bred by the Hungarian warlords as a gun pointing dog. The story goes that when the warlords went away waring, they left the Vizsla’s at home to protect their families. The breed is therefore good with kids and also very protective of the family — a perfect combination in my opinion. While King Roger is happy to lounge around all day (as long as he has company), he also loves to run. I recently bought a skateboard. 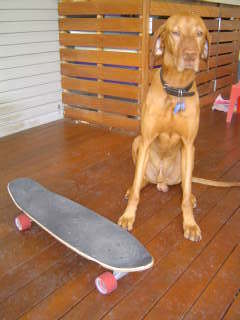 I ride the board and he runs alongside (towing me at times too!) for up to 10 km a day. That takes us about 40 minutes. That is great exercise for both him and me. King Roger has not been de-sexed and is available for breeding/mating should anyone in the Brisbane area be interested. Pingback: Rant, Rex » What a hoot!